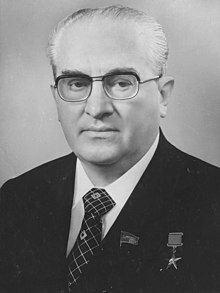 Yuri Vladimirovich Andropov (1914-1984) was a Soviet politician. He was born in Nagutskoye, Russian SFSR. Andropov was Director of the KGB for an unusually long time: 1967–1982 (Jan-May). He was General Secretary of the CPSU from November 12, 1982 until his death fifteen months later. He had diabetes mellitus and died of renal failure in Moscow, Russian SFSR.